2. 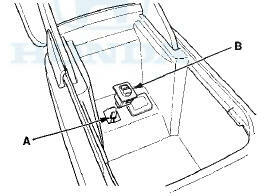 Disconnect the 5P connector (A), and carefully pull out the auxiliary jack assembly (B) from the center console box. 3. Install the auxiliary jack assembly in the reverse order of removal.